Notion studied by Euler and by Miquel in 1838. Other name, given by Miquel: syntrepent curves, literally "that turn together". Two curves and are called mating profiles associated to the centres of rotation O1 and O2 (the gear hubs) if can turn around O1 and around O2 so that the two curves always are in contact (i.e. tangent without slipping on one another). The get the curve when the curve , the hub O1 and the distance d = O1O2 are given, one only has to determine the movement of a plane over a fixed plane the base of which is and a roulette of which is the circle with centre O1 and radius d: the rolling curve is then the curve . In the case of a rolling movement of the two curves in opposite directions: If the polar equation of is written , the polar equation of is where g is defined by: . In other words, a polar parametrization of is . If the polar equation of is written , the polar equation of is where g is defined by: . In other words, a polar parametrization of is . If the polar equation of is written , the polar equation of is . Remark: this distinction makes sense only if we consider and are nonnegative. If we accept negative values, the second case is equivalent to the first one by changing into its opposite. Remark: By the Descartes theorem, the contact point between the two mating profiles is always aligned with the two hubs. - if is a circle with radius a and the hub is at its centre, is a circle with radius |d - a|. - if is an ellipse, with polar equation (the hub is therefore a focus), is a polygasteroid, with polar equation , where (n represents the number of turns completed by when completes one turn); if is the semi-major axis of the ellipse, the distances to the hubs are given by for gears turning in opposite directions, and for gears turning in the same direction. (G2) is an ellipse isometric to . The ellipse is said to be isotrépente for its focus. Case n = 2: is an inverse of the peanut. Remark: for a lower eccentricity (less than ) the ellipse is included inside its mating profile. Remark: if is a hyperbola, the same property holds, but is not illustrated here, because the hyperbola is not a closed curve. See the case n = 1 on the page of the hyperbola. - if is a logarithmic spiral, is an isometric logarithmic spiral; the logarithmic spiral is therefore also an isotrépente curve. This mechanism was discovered by the astronomer Ole Rømer. It is used in the "varistart" system, and allows for a progressive increase of the rotation speed of a gear. Cams composed of arcs of logarithmic spiral, drawn by Henri Bouasse. Opposite, the case k = 18/5. Opposite, the case k = -5/3. Schroeder gears dating from 1867, coming from the Musée des Arts et Métiers. The bottom curve is a limaçon of Pascal. 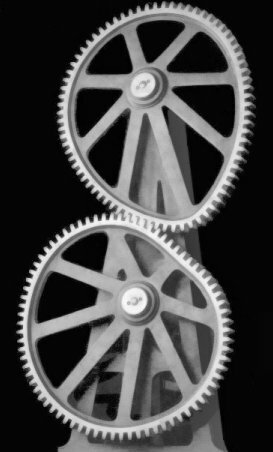 When the hub of one of the gears is at infinity, we get a wheel-road couple. For similar vehicles, but with a linear motion, see the next page. See also the hyperboloid gears, generalisation to space of this planar notion, at the bottom of this page.